Beautifully engraved specimen certificate from the Digital Island printed in 1999. This historic document was printed by the Security-Columbian United States Banknote Corporation and has an ornate border around it with a vignette of the company logo. This item has the printed signatures of the Company’s President & Chief Executive Officer ( Ruann Ernst ) and Chief Financial Officer. June 19, 2001 - Cable and Wireless plc (LSE: CW. 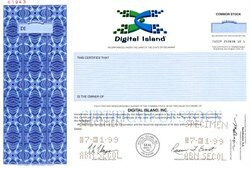 ; NYSE: CWP) ("Cable & Wireless") and its wholly owned subsidiaries, Cable & Wireless USA, Inc. (Cable & Wireless USA") and Dali Acquisition Corp., announced today the completion of their tender offer for all of the issued and outstanding shares of common stock of Digital Island, Inc. (NASDAQ: ISLD) ("Digital Island"), which expired at 12:00 midnight, New York City time, on Monday, June 18, 2001. As of the expiration of the Offer, 65,806,609 shares of Digital Island common stock, representing approximately 80.0% percent of the total issued and outstanding shares, had been tendered pursuant to the Offer, including 7,924,361 shares tendered pursuant to notice of guaranteed delivery. Cable & Wireless, Cable & Wireless USA and Dali Acquisition Corp. have accepted all such shares for payment. Payment for validly tendered shares will be made promptly through Computershare Trust Company of New York, the Depositary for the Offer. Digital Island has joined with the businesses of Exodus Communications and hosting services from Cable & Wireless to form Exodus, a Cable & Wireless Service. This new company combines the leading services and expertise of both Digital Island and Exodus with Cable & Wireless' powerful global infrastructure to provide a unique offering in managed hosting and interactive Web services for enterprise customers. Digital Island customers now for the first time have access to true end-to-end Internet outsourcing solutions from one trusted provider. Additionally, they are served by an enlarged group that is able to provide the quality, continuity and stability of service that they need. 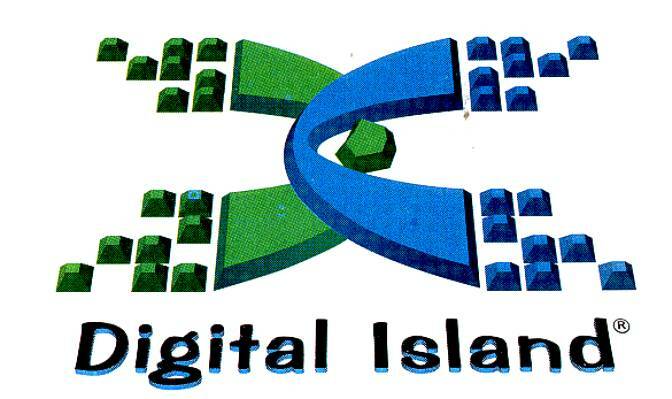 Digital Island® was a leading global e-Business Delivery Network. The company's suite of application services for interactive e-Business allows customers and partners to readily integrate content delivery, hosting and intelligent networking to give the ultimate consumer a superior experience. Strategically located Data Centers in the United States, Europe and Asia are directly connected to leading access service providers in 23 countries. In addition, Digital Island operates a network of more than 1,200 content distributors across the Internet, which improves the performance and reduces the cost of hosting high-volume Web applications in target markets. This network was expected to grow to 6,200 content distributors in 350 locations worldwide by the year 2003.